Larco Engineering supply a wide range of internal and external Fast Action Doors. 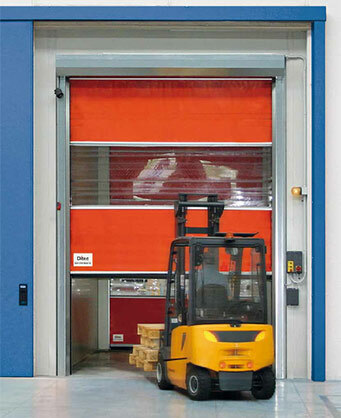 Rapid Action Doors are a rapid roll door with a self-relocating curtain. 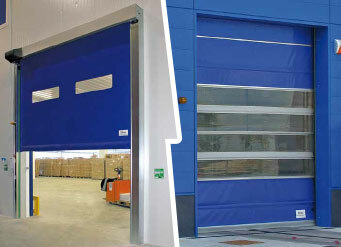 These industrial doors have an opening speed of up to two metres per second. The Roll Fast Door is low maintenance and cost effective. The curtain re-seals if hit by traffic which dispenses with the costly call out of engineers and keeps your operation active. mechanisms means our Fast Action Doors are ideally suited to high volume areas. Our doors enable you to control temperature loss and help you to become more energy efficient in today’s fast moving environment. Larco Engineering offer a wide range of Fast Action Doors from a simple pull cord operated door to induction loops, radar sensors or swipe card operated doors. Our doors come with a 3 phase electric motor and push button controller as standard that can be programmed to your operational requirements. Our Fast Action Doors come in Food safe, insulated and standard ranges and can operate in temperatures of -25 to +70°c. Our Fast Action Doors are fully washable and ideal for the food industry environment. Our doors have been specifically designed so that they can be fully jet washed and there are no areas for build-up of contaminants. 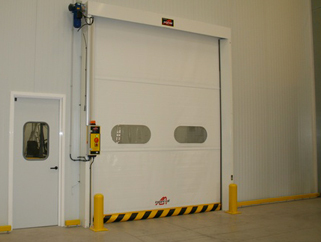 Fast Action Doors are also commonly known as Rapid Roll Doors, High Speed Doors and Hi-Speed Doors. Larco Engineering also repair damaged Fast Action Doors so contact us today for a quote.